1. Wash the leaves and drain it properly. 2. Heat the pan with oil and add the sliced onion and bay leaf. Fry the onion till it becomes soft. 3. Add turmeric, garlic, coconut cream and 1 teaspoon salt. 4. Cook it till oil comes out and add the prawn. 5. When the prawn is half cooked and add the leaves, chillies and ½ cup of water. 6. Stir it and cook it under closed lid till leaves become tender. 7. Stir it and add coriander leaves and check the salt. 8. 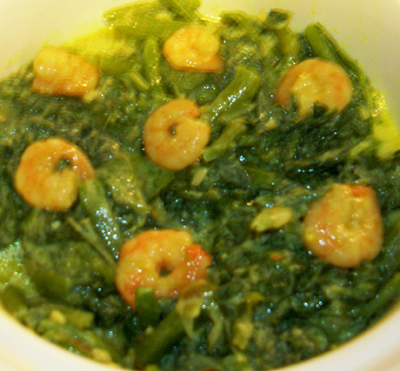 Turn off the heat and serve pumpkin leaves with prawn (kumra shak) with hot rice.